For other uses, see Subtropical (disambiguation). 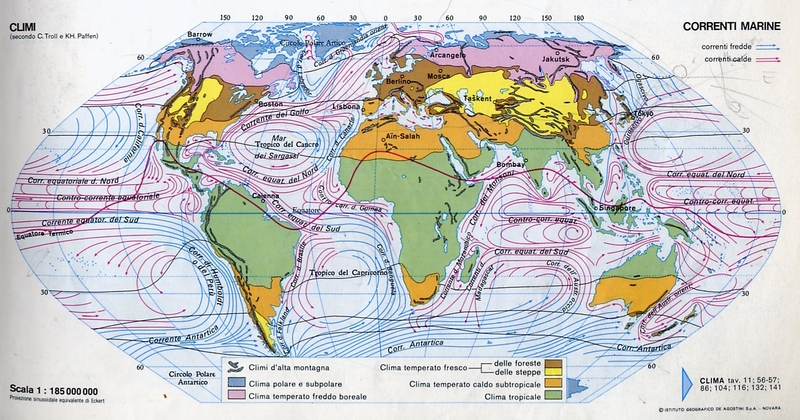 The subtropics are geographic and climate zones located roughly between the tropics at latitude 23.5° (the Tropic of Cancer and Tropic of Capricorn) and temperate zones (normally referring to latitudes 35–66.5°) north and south of the Equator. Subtropical climates are often characterized by warm to hot summers and cool to mild winters with infrequent frost. Most subtropical climates fall into two basic types: humid subtropical, where rainfall is often concentrated in the warmest months (for example Brisbane, Queensland or Jacksonville, Florida), and dry summer climate or (Mediterranean), where seasonal rainfall is concentrated in the cooler months (for example Naples, Italy or Los Angeles, California). Subtropical climates can occur at high elevations within the tropics, such as in the southern end of the Mexican Plateau and in Vietnam and Taiwan. Six climate classifications use the term to help define the various temperature and precipitation regimes for the planet Earth. A great portion of the world's deserts are located within the subtropics, due to the development of the subtropical ridge. Within savanna regimes in the subtropics, a wet season is seen annually during the summer, which is when most of the yearly rainfall falls. Within Mediterranean climate regimes, the wet season occurs during the winter. Areas bordering warm oceans are prone to locally heavy rainfall from tropical cyclones, which can contribute a significant percentage of the annual rainfall. Plants such as palms, citrus, mango, pistachio, lychee, and avocado are grown within the subtropics. There are places on this planet, where altitude and latitude combine to form a harmonious, temperate balance. High in the clouds of the tropics, there is an escape from the humidity and heat of the forests and plains below. These mountains, valleys and plateaux are places of flourishing cities, breath-taking beauty and the setting of unique cultures and history. Defined by their special climate, these are the world’s Subtropical Highlands. So far in this series, we’ve been looking at the hot and humid climates of the tropics – the Rainforest, the Monsoon and the Savannah. Before we leave the tropics and head to greater latitudes, however, there is one final type of climate here that we cannot overlook, and that is the one in the highland regions near the equator. As one increases in altitude, the temperature of the air decreases – this is evident to anyone who looks up at a high mountain and sees snow on its summit. But in the tropics, where the temperature at sea level is high, there is a wide band of altitudes that produce mild and pleasant temperatures all year round. This year-round mildness is unique among all world climates, and has made these regions attractive for human settlement throughout history, offering increased comfort, and avoidance of tropical diseases, such as malaria. There are two variations within the Koppen Climate Classification, distinguished by rainfall patterns. The first, Cwb, is the most common, and this is basically a high-altitude cooler version of the Tropical Monsoon and Savannah climates that we covered in the last episode. It is characterised by a distinct wet and dry season. The other, Cfb, is, like the first, a cooler high altitude equivalent of a lowland tropical climate, in this case, the Tropical Rainforest. With Cfb we find no dry season, and rain all year round. It is a quirk of geography, that we find this climate very similar to that of the Oceanic climate of Britain and North-West Europe, in that it is cool and moderate with rain all year round. More, much more about that one in a future episode. So where in the world do we find the Sub-Tropical Highlands? In terms of latitude they're between the Tropics of Cancer and Capricorn – 23 degrees north and south of the equator. And these areas are high up, usually between 1500 and 4000m (5,000 to 13,000 feet). Starting in the Americas, we find the densely populated central valley of Mexico, home to that country’s capital and mega city of the same name, and once home to the famous Aztec Empire. Onto South America, and Colombia and Ecuador are the two countries that are dominated by the rarer Cfb variant of the Subtropical Highland climate that gives year-round rain. Almost all of the major cities in these countries are packed into the high valleys of the Andes that run through this area, including the capitals of Bogota and Quito. Heading further south, we encounter the highlands of Peru and Bolivia, once the home of the Inca Empire and now home to, among others the highest capital city in the world – La Paz of Bolivia. Moving across now to Africa, and almost all the lands within this climate zone follow a line north to south along the huge Rift Valley that dominates the eastern part of this continent. Starting in the north and we find the heart of Ethiopia and its capital Addis Ababa. As we head south, we encounter the high plains of Kenya and its capital Nairobi. Parts of Uganda, Congo, Burundi, Rwanda and Tanzania intersect this climate where the lands rise up high enough. Much of Malawi, Zambia and Zimbabwe are high enough to experience this mild climate, including all these countries’ capital cities. At the southern tip of the continent, we find the north eastern heart of South Africa coming within this climate zone, including that nation’s capital of Pretoria, and its largest city, Johannesburg. The last continent to experience the Subtropical Highland climate is Asia, where, in the southern foothills of the Himalayan mountains, altitudes are in the sweet spot to provide an all year round spring to Kashmir in northern Pakistan, the northern extremes of India, much of Nepal, including its capital Kathmandu, and a large swathe of Yunnan Province in south-west China. Far to the south of the Himalayas, upland areas of southern India and Sri Lanka also experience this climate. So what kind of landscapes and agriculture do we find in the subtropical highlands? Well, that depends upon altitude, and how much rainfall we see. In uncultivated land, the lower reaches are covered in either thick forests, such as the well-known “cloud-forests” of the Andes that are extensions of the Tropical Rainforest, or grasslands which are merely extensions of the Savannah, most notably in Africa. Higher up we find unusual plants specifically designed to withstand the higher altitudes, and are unique to this climate. When it comes to land cultivated by humans, we find spectacular landscapes carved out of the hillsides - terraced farming in abundance, rice in Asia in the present day, and corn in the once-Inca Empire of South America. And the most remarkable fact I’ve saved until last. Because the Subtropical Highland climate has two very special plants. One produces a leaf, another a bean. Each of these makes up a drink, and between them they drive our working world. They are probably the most widely drunk beverages throughout the globe. I’m talking, of course, about tea and coffee, and they’re uniquely suited to this climate, not growing easily anywhere else. So that’s it for this climate zone. I hope you found it as surprising as it was enlightening. As always, I encourage you to share this video with those you know, and if you haven’t already done so, please subscribe to this YouTube channel so you don’t miss future episodes. If you are passionate about our planet and want to the support the production of this series, you can contribute via my Patreon page. I want to thank especially the many drone pilots and cameramen who gave permission for their remarkable footage to be shown this video, in particular Milosh Kitchovitch and Thomas Noisel. You can check out their channels, and all the others listed via links in the text that accompanies this video. Thanks again for watching, and I’ll see you in the next episode. The tropics have been historically defined as lying between the Tropic of Cancer and Tropic of Capricorn, located at latitudes 23.45° north and south, respectively. According to the American Meteorological Society, the poleward fringe of the subtropics is located at latitudes approximately 35° north and south, respectively. Tadrart Acacus desert, part of the Sahara, in western Libya. Several methods have been used to define the subtropical climate. In the Trewartha climate classification, a subtropical region should have at least eight months with a mean temperature greater than 10 °C (50.0 °F) and at least one month with a mean temperature under 18 °C (64.4 °F). German climatologists Carl Troll and Karlheinz Paffen defined Warm temperate zones as plain and hilly lands having an average temperature of the coldest month between 2 °C (35.6 °F) and 13 °C (55.4 °F) in the Northern Hemisphere and between 6 °C (42.8 °F) and 13 °C (55.4 °F) in the Southern Hemisphere, excluding oceanic and continental climates. According to the Troll-Paffen climate classification, there generally exists one large subtropical zone named the warm-temperate subtropical zone, which is subdivided into seven smaller areas. Heating of the earth near the equator leads to large amounts of upward motion and convection along the monsoon trough or intertropical convergence zone. The upper-level divergence over the near-equatorial trough leads to air rising and moving away from the equator aloft. As the air moves towards the mid-latitudes, it cools and sinks, which leads to subsidence near the 30th parallel of both hemispheres. This circulation is known as the Hadley cell and leads to the formation of the subtropical ridge. Many of the world's deserts are caused by these climatological high-pressure areas, located within the subtropics. This regime is known as an arid subtropical climate, which is generally located in areas adjacent to powerful cold ocean currents. Examples of this climate are the coastal areas of southern Africa (Namibia, South Africa), the south of the Canary Islands and the coasts of Peru and Chile. The humid subtropical climate is often located on the western side of the subtropical high. Here, unstable tropical airmasses in summer bring convective overturning and frequent tropical downpours, and summer is normally the season of peak annual rainfall. In the winter (dry season) the monsoon retreats, and the drier trade winds bring more stable airmass and often dry weather, and frequent sunny skies. Areas that have this type of subtropical climate include Australia, Southeast Asia, parts of South America, and the deep south of the United States. In areas bounded by warm ocean like the southeastern United States and East Asia, tropical cyclones can contribute significantly to local rainfall within the subtropics. Japan receives over half of its rainfall from typhoons. Curitiba, Brazil: Live oak with araucarias. Wetland Park in Hong Kong. Humid subtropical climates lie on the lower east side of continents, roughly between latitudes 25° and 35° degrees away from the equator. In the United States, the humid subtropical zone is normally considered the region from central Florida north to northeastern North Carolina. The Mediterranean climate regime resembles the climate of the lands in the Mediterranean Basin, parts of coastal southwestern North America(including western parts of the Pacific northwest), parts of Western and South Australia, in southwestern South Africa and in parts of central Chile. The climate is characterized by hot dry summers and cooler winters with rainfall. In Europe, the northernmost mediterranean climates are found along the French Riviera, located at 43° latitude. On the immediate Atlantic coastline, the mediterranean boundary goes between Porto and Vigo at around 41° latitude. Parts of southwestern Australia around Perth have a Mediterranean climate as does areas around coastal South Africa. ^ I. G. Sitnikov. "1" (PDF). Principal Weather Systems in Subtropical and Tropical Zones. 1. Encyclopedia of Life Support Systems. ^ Glossary of Meteorology (25 April 2012). "Subtropics". American Meteorological Society. Retrieved 24 March 2013. ^ Dr. Owen E. Thompson (1996). Hadley Circulation Cell. Archived 5 March 2009 at the Wayback Machine Channel Video Productions. Retrieved on 11 February 2007. ^ ThinkQuest team 26634 (1999). The Formation of Deserts. Archived 17 October 2012 at the Wayback Machine Oracle ThinkQuest Education Foundation. Retrieved on 16 February 2009. ^ a b "Tropical and subtropical desert climate". ^ Susan Woodward (2 February 2005). "Tropical Savannas". Radford University. Archived from the original on 25 February 2008. Retrieved 16 March 2008. ^ Randy Lascody (2008). The Florida Rain Machine. National Weather Service. Retrieved on 6 February 2009. ^ Geoffrey John Cary; David B. Lindenmayer; Stephen Dovers (2003). Australia Burning: Fire Ecology, Policy and Management Issues. Csiro Publishing. p. 33. ISBN 978-0-643-06926-8. ^ Whipple, Addison (1982). Storm. Alexandria, VA: Time Life Books. p. 54. ISBN 978-0-8094-4312-3. ^ Remote Sensing for Migratory Creatures (2002). Phenology and Creature Migration: Dry season and wet season in West Mexico. Arizona Remote Sensing Center. Retrieved on 6 February 2009. ^ J. Horel (2006). Normal Monthly Precipitation, Inches. Archived 13 November 2006 at the Wayback Machine University of Utah. Retrieved on 19 March 2008. ^ D. Bozkurt, O.L. Sen and M. Karaca (2008). Wet season evaluation of RegCM3 performance for Eastern Mediterranean. EGU General Assembly. Retrieved on 6 February 2009. ^ Ron Kahana; Baruch Ziv; Yehouda Enzel & Uri Dayan (2002). "Synoptic Climatology of Major Floods in the Negev Desert, Israel" (PDF). International Journal of Climatology. 22 (7): 869. Bibcode:2002IJCli..22..867K. doi:10.1002/joc.766. Archived from the original (PDF) on 19 July 2011. ^ Walter Tennyson Swingle (1904). The Date Palm and its Utilization in the Southwestern States. United States Government Printing Office. p. 11. ^ Wilson Popenoe (1920). "Manual of Tropical and Subtropical Fruits: Excluding the Banana, Coconut, Pineapple, Citrus Fruits, Olive, and Fig". Nature. 108 (2715): 7. Bibcode:1921Natur.108Q.334.. doi:10.1038/108334a0. hdl:2027/hvd.32044106386147. Retrieved 24 March 2013. ^ R. K. Kholi; D. R. Batish & H. B. SIngh. "Forests and Forest Plants Volume II – Important Tree Species" (PDF). Encyclopedia of Life Support Systems. Retrieved 9 April 2013. ^ Michael Ritter (24 December 2008). "Mediterranean or Dry Summer Subtropical Climate". University of Wisconsin–Stevens Point. Archived from the original on 5 August 2009. Retrieved 17 July 2009. ^ "Victoria Gonzales HTS, British Columbia". Canadian Climate Normals 1971–2000 (in English and French). Environment Canada. 2011-01-19. Retrieved 15 February 2013.